When entering university, many students are advised over and over to network. It doesn’t come easy to some, and this was definitely the case for Bachelor of Commerce student Simone James. Now, on the brink of her graduation, Simone has a wealth of experiences under her belt, both in Australia and abroad, most recently at Stanford University. We sat down to talk start-ups and how networking and a growth mindset has opened up a myriad of opportunities and experiences. What was the driver for you to start thinking in an entrepreneurial way? It actually all started from a subject I took last year, Entrepreneurial Marketing, where I first started thinking about the startup world. I started to look for opportunities that would offer what had already intrigued me on paper, which then brought me to a 3-Day Bootcamp at the Wade Institute, and the amazing entrepreneurship programs I have now been a part of over the past year. - Pitch day at ASES Summit. 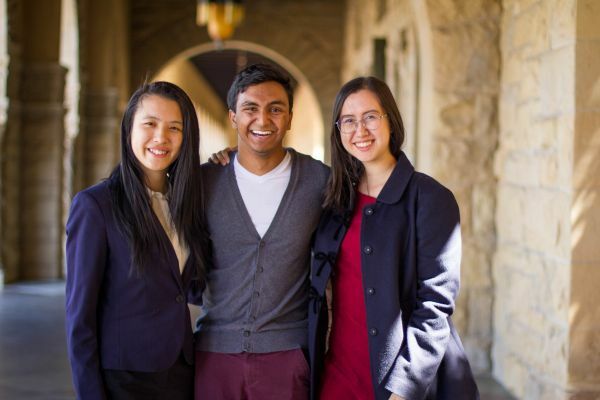 Simone, with Australian delegate Jessica Fang and Stanford student Shrey Gupta. You’re weren’t a fan of networking…yet. What changed that for you? The first time I ever attended a networking event was the UniMelb StartUp Competition’s ‘Mixer Night’. I went alone with no idea how to approach people. I was about to leave but a text from a friend ensured I stuck around to try something different. I ended up meeting my future team-mates, we would later go on to win the Unimelb StartUp Pitch Competition together with our idea, ImmunoBuddy. That’s a pretty good outcome. Did that drive you to the next project? Shortly after, UniMelb launched a two-month hackathon, Autohack18, focusing on automation and social impact, with a prize for the winning team to travel to San Francisco. Being more technically based, I saw it as a chance to learn more about a field that was becoming increasingly relevant. I met a team of people at the information session from different backgrounds including Computer Science and Engineering, and have adopted a new technical vocabulary since. After progressing through the heats, we received $1000 funding to develop a physical prototype and demonstrate at the finals. Our team was fortunate enough to win Autohack18 with our idea, Canary Reports, incident reporting software for the mining industry. 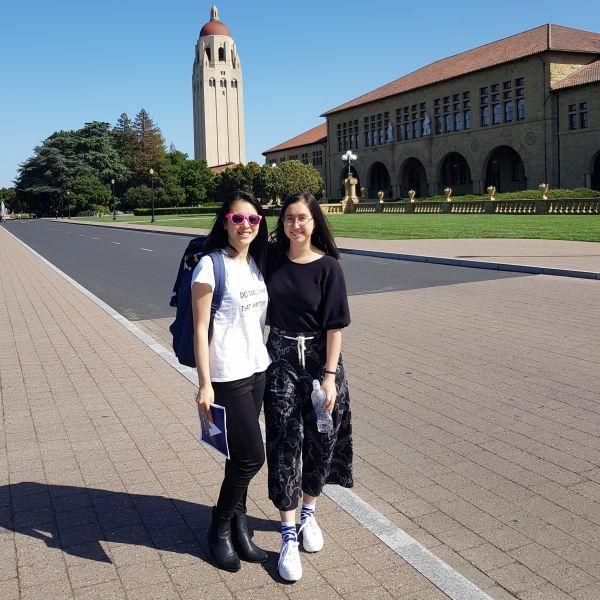 - Outside Stanford University main entrance with fellow delegate, Jessica Fang. This takes us to Stanford. Tell us about your experience here. In April I attended the Asia-Pacific Student Entrepreneurship Society (ASES) Summit, each day was packed to the brim with speakers, workshops, networking events and a pitch competition at the end of the week. One of the absolute highlights was meeting Sam Yam, the co-founder of Patreon. He shared the humble beginnings of Patreon’s first pitch with a simple problem they wanted to solve. Initially, the solution wasn’t so obvious, but through the iterative process and persistence, success followed. It was refreshing to be reminded that the best ideas don’t come from the most aesthetic slide decks or largest market size, but instead less tangible aspects such as a flexible approach combined with a diverse team, unique skill-sets and drive. 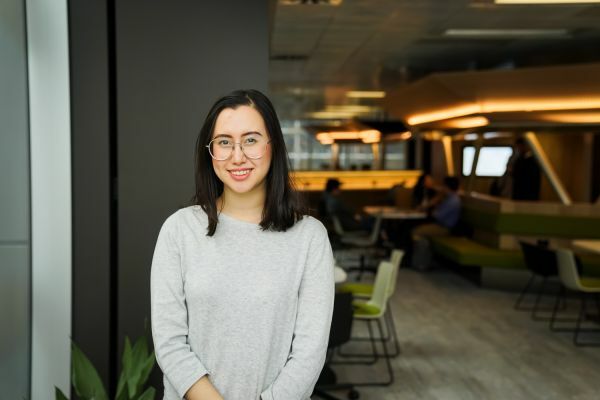 ● Join mentoring programs – I met two incredible mentors through the Access Connections Mentoring Program at UniMelb. ● Mentors appreciate when they know how to help, remember to set clear goals on what you want to achieve so it is easier for others to assist you. ● When connecting with peers, build collaborative relationships by thinking about what you can offer others rather than what they can offer you. ● Establish networks with people who have different backgrounds to you, as diversity generates innovation. Instead of sticking exclusively within your faculty, attend a variety of university events. How have these experiences shaped your way of thinking? I’ve taken on board a growth mindset that I believe is an attitude towards self-development, understanding that our abilities are malleable and can be developed over time, rather than being a fixed state. I didn’t realise this until recently, and I think participating in these programs helped me attribute success to hard work and resilience, rather than my innate traits. This was important because over time the setbacks I faced were viewed as opportunities to learn, rather than a diminished sense of self-belief. This attitude has led me to experiences that have been invaluable to my growth, both personally and professionally. I’ve developed life-long friendships and have become less afraid to break the first ‘hello’ at a networking event because I now understand the possibilities a single connection can create. Albeit a bit late – I’m beginning my search for a graduate role! I’m looking at dipping my toes in Management Consulting or a role in a startup where I get to really address the needs of a niche market. In the mean-time I’m working on a project I am extremely excited about, which blossomed from my trip to Stanford. There I met the President of a consulting group in Sydney called BusinessOne – who primarily run student consulting projects for start-ups. It was the perfect blend of both worlds that I wanted to be a part of. Serendipitously, they were looking to expand and were looking for a team of founders of the UniMelb chapter. I have now taken on the role in the founding team at BusinessOne UniMelb and we’ve recently recruited a bright team of 20 students for our Semester 2 launch. I’m looking forward to helping these students leverage their skill-sets, build confidence and a community during their time at university. Learn more about Case Comps and Entrepreneurship opportunities while studying the Bachelor of Commerce.